Our Montreal practice is devoted to promoting healthy and beautiful smiles throughout our community. With an outstanding team of dental professionals, we aim to ensure that you have the care and attention you need to help your smile be as healthy as possible. As an innovative dental practice, we strive to stay up-to-date on all the latest techniques and technologies to care for our patients. Whatever dental health issue you may be facing, you can rely on our dentists to provide the care and attention you need. Contact our office and schedule a visit today! Our office has been custom designed and built to provide a refreshing and inviting atmosphere. Clean, well lit, and spacious, we’ve created this space to reflect the quality and attention to detail you’ll always find in our work. Our operatories feature innovative technology available in modern dentistry. We use digital x-rays to capture clear and precise images of our patients’ dental health, and a microscope during exams to help us make an accurate diagnosis and recommend the most appropriate treatment. Several of our procedures include the use of dental lasers, which many of our patients appreciate. We also strive to stay innovative in the treatment we provide. Our dentists constantly work to stay up-to-date on the latest developments in dental care so that we can more efficiently diagnose, treat, and protect your teeth. When you visit us for dental care, you can rely on us to create a treatment plan that is effective, conservative, and dedicated to preserving your natural smile. We focus on minimally invasive treatments, limiting the impact of treatment as well as your recovery time. With our commitment to efficiency and attention to detail, you can be confident that no aspect of your health or care will be overlooked. At Drummond Dental Group, we love helping our Montreal community enjoy healthier, happier smiles. 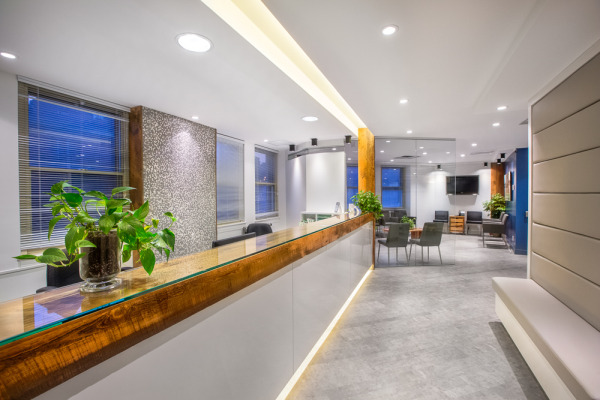 Whatever level of dental care you need, you’ll feel comfortable and welcomed in our beautiful, state-of-the-art dental practice. Contact our office and schedule your visit today! We look forward to helping you take care of your smile!